First clear image. NASAInsight tweet: "There’s a quiet beauty here. Looking forward to exploring my new home. #MarsLanding"
For astrobiologists, one particularly interesting thing about this lander is that it is the first one to use a robotic mole. It will drill to a depth of 16 feet (about 5 meters). This is of interest for astrobiology, especially for the search for past life. ExoMars will be able to drill to 2 meters using a different technique and nothing else has been able to drill to anything like this depth. Viking scraped a shallow trench and most just drill mms into rocks. InSight is not an astrobiology mission; it's drilling in order to get a heat profile and learn about heat flows to help study the Mars interior. But it is the first test of robotic mole technology on Mars. The name is very apt. It's a little self contianed unit with a hammer that kind of hammers away and sinks into the ground as it hammers and the soil then closes up above it as it drills. it is just like a mole. If you could watch it you'd see it burrowing away into the soil and vanishing from sight just leaving a wire poking out of the ground. The thing is, in the vacuum conditions conventional drilling doesn't work. You can't use lubricants because it is a near vacuum (and anyway you'd have all the weight of lubricants to source somehow). Meanwhile the regolith is quite soft. And you want to carry as little mass with you as possible, don't want long continuous drililng shafts. Moles seem to be the best way to drill there. The UK Beagle 2 lander was the first and only previous mission to send a small robotic mole to Mars, it landed successfully but sadly wasn't able to open the last of its solar panels and signal back to Earth. It is pioneering technology that could be useful for future astrobiological missions to Mars, though sadly Mars 2020 won't have a drill able to drill to any significant depth. ExoMars will, to a depth of 2 meters, but using a different method. In the press conferences they said that the self hammering mole can nudge its way past rocks of up to 2 cms width, can also get past rocks that present a slanting face but if it hits a flat rock face on it just has to stop. Where it landed they think it can probably reach to a depth of about 10 feet and possibly the full depth of 16 feet (5 meters). That would be a useful depth for searches for organics of past life not deteriorated by the cummulative effects of hundreds of millions to billions of years of surface cosmic radiation. From time to time it releases pulses of heat. Then it looks at how long it takes for its own body to heat up. This gives it information about the conductivity of the surrounding soil (regolith). 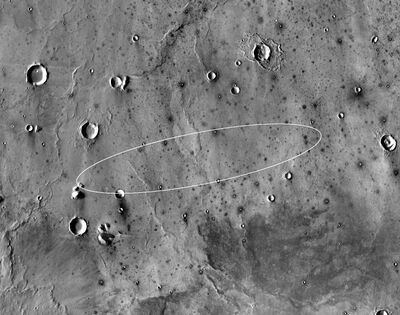 NASA's InSight mission picks perfectly dull landing site - unlike most landers, the aim is to be dull :). 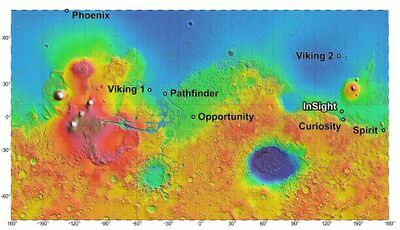 They aren't looking for interesting and varied geology or places where there could be past or present day life, indeed, the more typical and boring it is, the better for their mission objective to find out about Mars's interior. The lander also has a weather station which will be the first one to operate continuously, both day and night on Mars instead of just a few readings a day. It will record temperature, pressure, and wind direction and speed continuously. The reason it does this is because the seismometer will be affected by all these things. It is so sensitive that it will record even deflections of the surface due to passage over of a pressure variation in the atmosphere. As a side effect this means that we have the first continuous measurements from Mars which may well turn up surprising discoveries. Mars InSight Lands on November 26th. 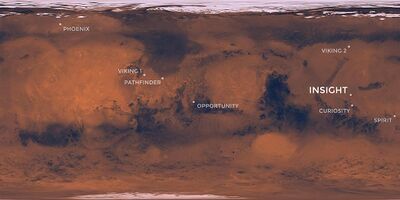 Here’s where it’s going to touch down shows the landing site on a Mars global map. Also explains more about how the selected the site in order to have solar power they needed to be in the equatorial regions. Mars Cube One - the two briefcase sized 'cube sats' which succcessfully relayed back telemetry and also the first image from the surface. They were on a separate trajectory and did a flyby of Mars and then headed off into interplanetary space. 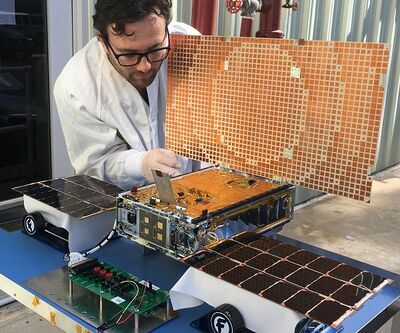 Mars-bound CubeSats Launch With NASA’s InSight lots of details about the cube sats - size, statistics, phtograph of a deployed cube sat on a bench etc. The Mars cubesats actually were sent to Mars on their own independent trajectories using tiny thrusters for course corrections. The big antenna is used to communicate back to Earth, a design that lets them focus the signal with a flat antenna. There is a small receiver to receive signals from Insight in the base of the satellite that deploys on springs. They communicate independently back to Earth too, the cubesats could fly to Mars by themselves so are true interplanetary cube sats. They are each about the size of a large briefcase and they are technology demonstrators. If they are successful then we may get direct transmission back to Earth of the Entry, Descent and Landing, which would arrive about three hours earlier than the signal relayed from its orbiters which will record it and then retransmit. InSight Diary: The silence of space - exceedingly sensitive seismometers, so senstivie they couldn't find anywhere on Earth quiet enough to test them, when the tested them deep in a mine in the Black forest in Germany the strongest signal was from the sea, hundreds of miles away - which would be far stronger than any feeble Mars quakes. They could only really test them once they were in flight on the way to Mars. The Viking Seismometers - how both Viking missions carried seismometers but they were only able to measure really major quakes. Viking 1 was not able to uncage its seismometer. 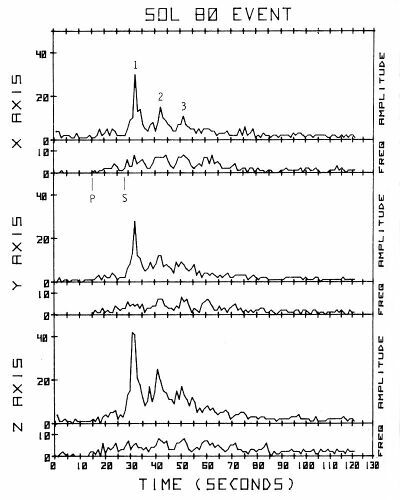 The Viking 2 one did uncage but only spotted wind data apart from one signal that may have been a Mars quake. Showed that with 95% confidence, Mars is less active than Earth. After landing, deploys the seismometer, and then the robotic mole experiments by lifting them onto the surface of Mars. The Viking seismometers were mounted on the spacecraft, this one is placed directly on the surface of Mars. This is hugely speeded up, the actual deployment takes about one month for each instrument and they should be ready to start measurement in spring 2019. Then it depends on how many Mars quakes there are but they expect the main science results in a preliminary way two years from now. InSight's seismometer can also detect the reverberations from the self hammering mole. This could let it detect the position of the supposed regolith / solid rock boundary layer. If there are any significant layers of water beneath the surface it could detect these too, by variations in the elasticity of the rock. Speculation: I've wondered if their seismometer will be able to detect the layer of brines that Curiosity found just a few cms below the surface. Curiosity found that it forms every day overnight and dries out in the daytime as it warms up, and found this layer indirectly through humidity measurements, whenever it drove over sand dunes. Not sure but the Elysia Planitium might be suitable ground for it to form. If Elysia Planitium has salts below the surface that can take up water from the atmosphere it might have similar brines too, and if so, perhaps the mole could notice the brines as a more heat conductive layer just below the surface as it starts to drill? Especially if the conductivity varied and was highest in the early morning, it might be the Curiosity brines. Just an idea. If this is a possibility there might be something to be said for drilling very slowly through the top 15 cms, sending frequent pulses of heat, and sending pulses from the same location through a day / night cycle, and monitoring to see if there is any day / night variation in the thermal conductivity that might indicate temporarily forming brine layers.